Analysis is performed for Demands, Safe Failure and Dangerous Failures (Dangerous Detected and Dangerous Undetected or a combination of the two together – See Demands and Failures). 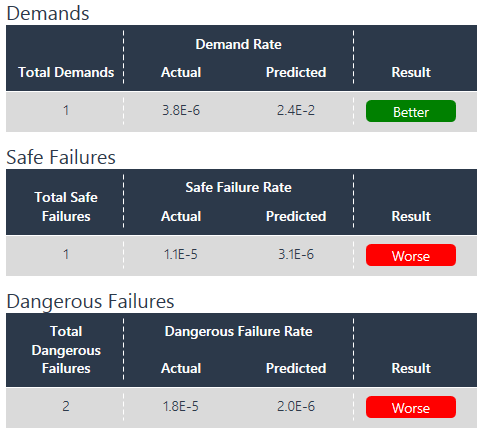 Actual Failure Rates are calculated for the Device Groups, with the number of failures and Result of the comparison to the Predicted Failure Rate shown on Devices Overview. Expanding the Group shows the Actual Failure Rate and the Predicted Failure Rate. The Failure Rate of the individual Device is also calculated and can be viewed by clicking on the required Device -> Demands And Failures -> Analysis. Safe and Dangerous Failures are calculated based upon the Chi-Square Methodology. The Chi-Square method as a default uses a confidence level of 95%. This can be customised within the Project Overview. The Demand Rate of the individual Device is calculated with the number of Demands and the Result show on the Devices Overview for each Device. The Actual Demand Rate and the Predicted Demand Rate can be viewed by clicking on the required Device -> Demands And Failures -> Analysis. Demands are calculated based upon the Number of Demand / Total Number of Device Hours. The highest contributing device can be shown up sorting on the relevant column on the Devices Overview table (i.e. Total Failure or Total Demands). The tolerance range can be customised within Project Overview, with the default set at +/- 10%.